The EOS M is now available at a range of retailers across the UK. It has an RRP of £769.99 including the 18-55mm standard lens and Speedlite 90EX flash gun. Apple Digital Camera RAW Compatibility Update 4.01 supports the EOS M (among other camera) for Aperture 3 and iPhoto '11. System requirements are Mac OS 10.7.5 or later or 10.8.2 or later. See http://support.apple.com/kb/DL1604 for more details. A firmware upgrade for the EOS 5D Mark III will add features for both still and video shooting. The new firmware offers improved AF performance and enhanced HDMI output. When the camera is fitted with a lens and extender, resulting in a maximum f/8 aperture, the new firmware enables the camera to use the EOS 5D Mark III’s central dual cross-type focal points, currently only available up to an f/5.6 aperture. Canon Digital Photo Professional (DPP) and EOS Utility have been updated to support the EOS M camera. DPP is at version 3.12.40 for Windows and version 3.12.41 for Mac OS. The software also supports the EF-M 18-55mm and EF-M 22mm lenses. The latest version of EOS Utility is 2.12.0 (Windows and Mac OS). Canon has launched its Winter Cashback offer giving you up to £160 cashback on selected purchases. If you purchase two Canon products included in this offer, you’ll receive an extra £25 cash back bonus. The two products must be bought from the same retailer at the same time to be eligible. The Winter Cashback offer delivers savings across a range of EOS cameras, EF and EF-S lenses, Extenders, Speedlites, a GPS unit, PIXMA multifunction printers and LEGRIA digital camcorders. The cashback offer is claimed by downloading and completing a claim form and returning it to Canon along with the original receipt by 28th February 2013. Firmware update v1.1.1 has been released for the EOS-1D X. It improves the scope and performance of the AF function and provides minor fixes. • The centre AF point (one cross-type with four supporting points) can now be used to autofocus at a maximum aperture of f8. This means that L-series telephoto zoom lenses will autofocus when used with an Extender (f5.6 lenses will only maintain autofocus with the Extender EF 1.4x I, II or III). • During AI Servo AF shooting in low light, viewfinder information is now illuminated. The AF points blink intermittently in red, allowing them to be easily confirmed whilst shooting without affecting the metering of the scene. 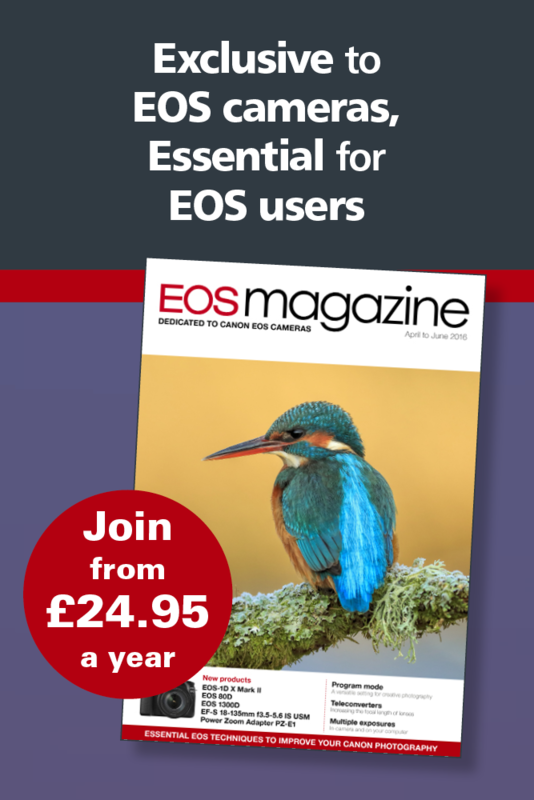 According to Canon, the main change for EOS Utility 2.12.0 is that it supports the EOS M.
However, a problem with the earlier EOS Utility 2.11.4 when used with Mac 10.7.x (Lion) or 10.8.x (Mountain Lion) was an incompatibility with the EOS 5D Mark III. This appears to have been resolved by the latest update. If you are using a Mac OS earlier than 10.6.8, Canon recommends that you use EOS Utility 2.10.2. Also, EOS Utility cannot be used with WFT on computers running Mac OS X 10.8.0 to 10.8.1 (it can be used on Mac OS X 10.8.2. EOS 1D X, 1D Mark IV, 1D Mark III, 1Ds Mark III, 5D Mark III, 5D Mark II, 7D, 60D, 60Da, 50D, 40D, 650D, 600D, 550D, 500D, 450D, 1100D, 1000D, EOS M.
The 'LCE Lincoln Photo and Optics Show 2012' takes place between 1 and 7pm on Wednesday 14 November. This annual event moves to a new venue: The Drill Hall, Free School Lane, Lincoln. Entry is free. The show brings together big name manufacturers such a Canon, Nikon and Sony along with a host of photo brands covering everything from tripods to monitor calibration. Attractions include hands-on demonstrations areas giving visitors the chance to get to grips with the latest products such as the Canon EOS 6D, Nikon D600 and Sony Alpha 99. Expert advice is on hand if required. There is a used camera marketplace featuring over 30 stalls of vintage, classic and modern equipment, with dealers looking to buy and sell all kinds of vintage, retro and traditional camera gear. LCE is also offering some great part-exchange deals on new equipment. For further details visit www.lincolnphotoshow.com or call LCE Lincoln on 01522 514131. Apple has released Canon Printer Drivers v2.10 for Mac OS X. The update installs the latest software for Canon printers and scanners. The update required Mac OS X 10.6.1 or later, including Lion and Mountain Lion. The file size is 322MB! The London Camera Exchange has two equipment shows planned for the beginning of December. A Canon Pro In-store day is on Saturday 1 December 2012 at 11 Civic Centre Road, Southampton. The LCE Digital Photo & Optics Show takes place on Sunday 2 December 2012, from 11am to 5pm at The Novotel Hotel, 1 West Quay Road, Southampton SO15 1RA. Lightroom 4.2 adds support for the EOS 650D and EOS M. It also adds tethered captured support for several recent EOS models, plus new lens profile support for recent lenses, including the three new STM lenses.